Barracuda Cloud-Generation Firewalls for AWS protect applications and workloads running in AWS environments. They support cloud deployment practices, AWS-specific use cases, and a frictionless licensing model that lets you pay based on firewall usage rather than time. As you migrate your workloads to AWS, it's crucial that you ensure the security of those workloads as part of the AWS shared security responsibility model. Barracuda APIs let you integrate security directly into your packaged applications with support for orchestration tools like Puppet. Barracuda adds virtually unlimited capability to remotely connect users to your AWS environment with granular control by user and application. Barracuda CloudGen WAFs are engineered for DevSecOps. Barracuda CloudGen WAF detects a wide variety of application security flaws, including all OWASP Top 10 vulnerabilities and countless zero-hour and advanced threats. It's a non-invasive, cloud-based tool, with no impact on your operations. The Barracuda CloudGen WAF has achieved the AWS APN Security Competency, meaning it's been pre-qualified by AWS Solution Architects as a well-designed solution. Its performance-tuning features include SSL offloading, load balancing, and content caching. Migrating a workload to AWS is the first step for many companies in their journey to the cloud. As a part of the shared security responsibility model, you are responsible for securing those migrated workloads. The Barracuda CloudGen WAF secures applications on AWS and makes it easier, safer, and more efficient to move your workloads to AWS. 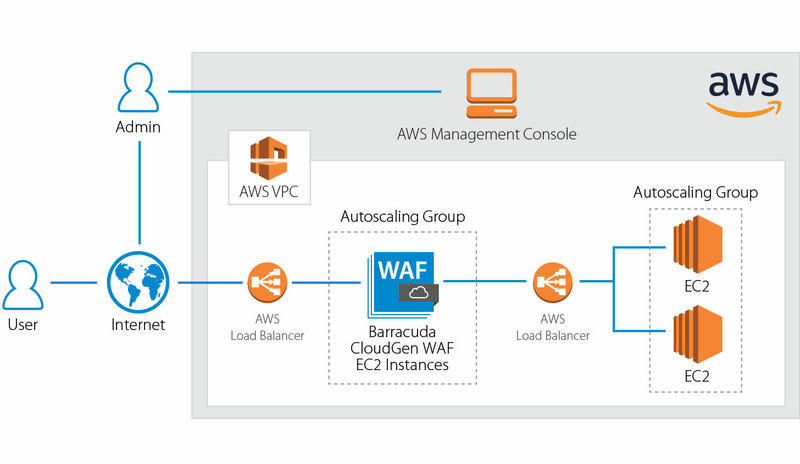 Barracuda CloudGen WAFs leverage AWS well-architected best practices, including autoscaling capabilities. When deployed in clusters - a standard Reference Architecture for redundancy and expandability - the Barracuda CloudGen WAF cluster can automatically scale up or down in real time to match fluctuations in workload demands. In the on-premises world, security is usually treated as a networking function. In the cloud, you can design security directly into your applications by using APIs. 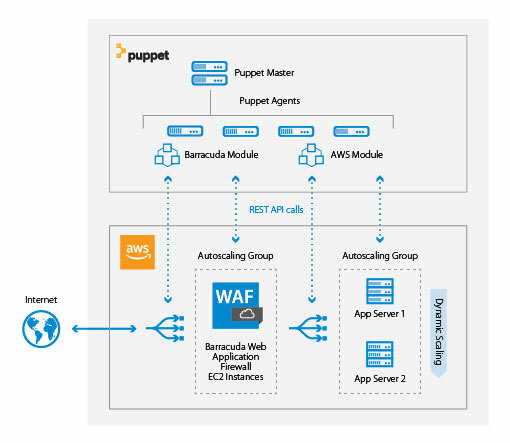 Published integrations with orchestration tools like Puppet let you automatically incorporate CloudGen WAFs into your packaged applications when they are deployed. Barracuda CloudGen WAF APIs are publicly available in GitHub and leverage features built into orchestration platforms without any changes to your application user interface or additional overhead. This streamlines development by removing the additional step of adding security into already-built applications, and it eliminates security vulnerabilities that were inadvertently designed-in. When moving from an on-premises infrastructure to the cloud, securing remote users access becomes critical. Your remote users need to have access across a range of devices – from mobiles to laptops. Unfortunately, the security built-in to such devices often leaves security gaps and compromises the ability to leverage AWS for these mission-critical applications. The CloudGen Firewall provides VPN clients for both desktop and mobile users. Highly granular access control that can be defined both by user and application further hardens your organization's security when running mission-critical apps in the cloud. The Barracuda CloudGen Firewall includes Barracuda's high-speed TINA tunnel. This was developed to overcome limitations that come with standard IPsec connections, and TINA (Transport Independent Network Architecture) protocol allows the use of TCP, UDP, and ESP for high speed VPN connections, which improves the VPN connectivity and supports transit VPCs. AWS makes it very easy for us to scale and innovate. We rolled out a new mobile app, branded by each club, and we could not have done that without using AWS and Barracuda. Learn how Europol and Dutch Police layered native AWS security with Barracuda CloudGen WAF to ensure complete security while serving millions of daily visitors. 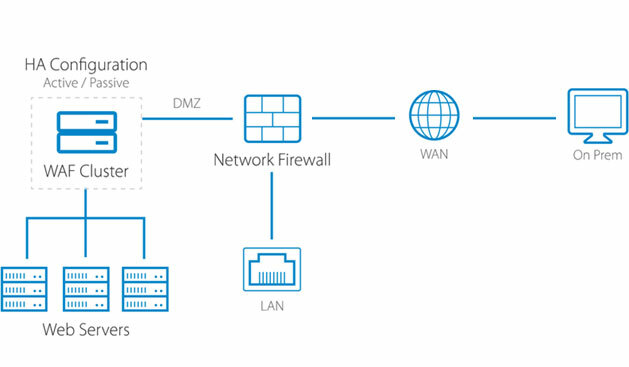 What makes a firewall Cloud Generation? The three key features of a Cloud Generation Firewall and how to unchain yourself from legacy architecture. Large CPG company undertook massive cloud migration using Barracuda CloudGen WAF to ensure security and protect against cyber threats. The cloud can be made even more secure than your on-premises environment, but only if you choose the right products to enhance your basic AWS infrastructure. Distributed Layer 4 security solution that was built for AWS and can be deployed in hybrid environments. Adds protection to solutions like Direct Connect. Protects web-facing applications from cyber-attacks including OWASP top-10 and advanced persistent threats, as well as providing full monitoring. A SaaS service that provides end-to-end visibility, continuous compliance and automated remediation of vulnerabilities in your cloud infrastructure and workloads. Barracuda is now offering a free 30-Day license for the Barracuda CloudGen Firewall and the Barracuda CloudGen WAF (Web Application Firewall) in AWS. The program includes Barracuda's award-winning, expert technical support. With the Cloud-Ready program, you can secure your cloud deployments as you roll them out. Our easy-to-use centralized management tools help ensure your admin tasks won't get more complex or time-intensive. Find us on the AWS Marketplace. Pay for secured traffic instead of firewalls by using the AWS metering service. This is true utility-based pricing which removes the friction of buying licenses. Deploy firewalls anywhere you want within your AWS environment and stay secure at scale. With the Bring Your Own License (BYOL) model, you purchase your annual firewall license from Barracuda for the required level of throughput and then install it in AWS. Your firewalls are active 24x7 throughout the duration of the license. Multi-year discounts are available. BYOL pricing is well suited to situations in which you require continuously available protection for a predictable, fixed operating cost. Pay-As-You-Go (PAYG) licenses charge you based on the time when your firewalls are active - unlike BYOL in which services are active 24x7. If your usage fluctuates, you can turn services on or off at certain times when they're not needed (such as non-work hours). PAYG is especially useful for customers that scale dynamically to match peak workloads. There is no need to manually turn firewalls off or reconfigure them when they are turned back on. AWS will do this automatically. You will only be billed when you're active. Complete this form to receive Free 24x7 technical support from Barracuda during your trial period. Learn more about protecting your workloads in the public cloud. By signing up for our newsletter, you're giving Barracuda Networks express consent to send you email communications.